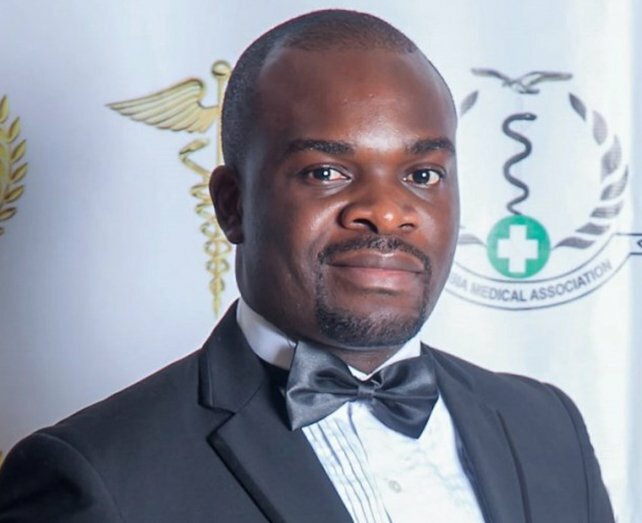 The Zambia Medical Association has strongly condemned a circular issued by Health Permanent Secretary Dr Kennedy Malama in which he has banned with immediate effect all health workers employed in the civil service from working for private hospitals. 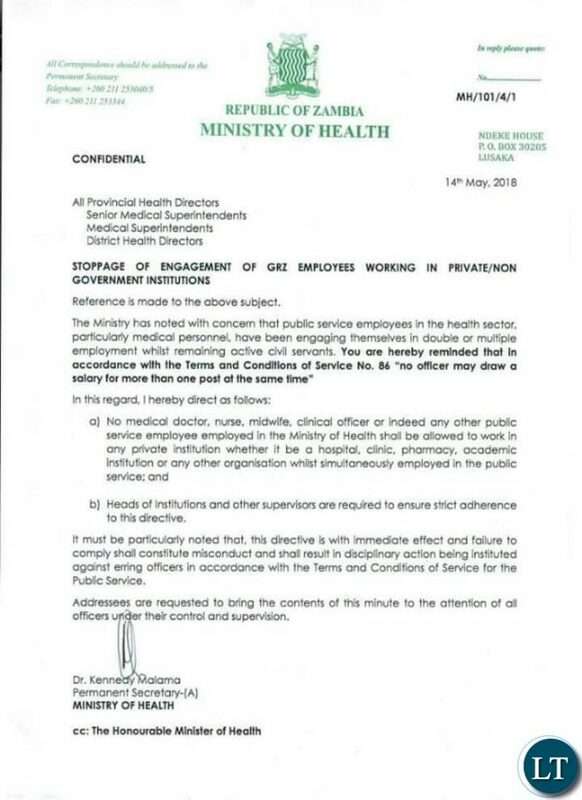 On Wednesday, Dr Malama issued a circular forbidding all public health workers to with immediate effect stop working in the private sector as this conflict civil service rules that forbid dual employment. But in a statement, Association President Dr Francis Mupeta has since warned government to desist from taking doctors for granted. Dr Mupeta stressed that there is no law that forbids citizens to have duo practice in public and private. He charged that directive from Dr Malama is ill-intended and that the circular is ambiguous and misleading adding that the Association doubts that the technocrats advising the Permanent Secretary mean well. The Zambia Medical Association has learnt with disbelief the circular from the Permanent Secretary-Administration of the Ministry of Health directing Provincial and district directors and Hospital Superintendents to stop medical personnel from being engaged in extra-economic activity such as private practice in private and public institutions. It is very disappointing that only medical personnel have particularly been singled out. This definitely amounts not only to intimidation but lack of appreciation of the Human Resource for Health despite what they put in to save the face limping health sector as far as Human Resource is concerned. Our position on the issue still remains the same as that given in 2015 that, “there is no law that forbids citizens to have duo practice in public and private. However, we take great exception to members who do not fulfil their man-hours in either public or private institutions and thus create the conflict and loss of trust in the accountability framework”. Further, we wish to condemn the directive as ill-intended as it disregards what obtains in practice. This statement, first of all, is ambiguous and misleading and we doubt that the technocrats advising the Permanent Secretary mean well. It is ambiguous in that it does not specify whether this includes work or employment done outside government man hours. The association is fully aware of the public service terms and conditions of service. Section no. 86, cited in the directive, pertains to an officer who hold dual employment. For example, while employed in the Civil Service, an officer accepts another employment on Full-time basis from either another government ministry/agency or draws two salaries while performing dual functionalities in the same or line Ministry. As stated in the 2015 position above, the Association does not condone workers who abscond from work either in government or private institutions to work elsewhere. In our view, section no.86 cited in the directive, implies as we have stated above and it shall continue to be until such a time as it shall be amended. We wish to assure our members and the members of the public equally, that no law shall be broken by any member of the Zambia Medical Association, or the medical fraternity in general, who wishes to engage in meaningful economic activity if they so wish outside their government contractual hours. If it was the intention of the Permanent Secretary to forbid doctors or other cadres from engaging in private practice at their own time, while serving in government, then we wish to state that the Permanent Secretary has misled himself. The Permanent Secretary is on record to have defended the sector on parliament grounds while appearing before the Parliamentary committee on Parastatals two score months ago! If this is not misleading the sector, then the office misled Honourable Members of Parliament on record. The public may wish to know that Zambia has a high patient-doctor ratio and as such, the lack of critical human resource has resulted in the failure to attain health sector targets such as Maternal mortality, infant and child mortality, Tuberculosis cure rates, case fatality rates from malaria and other disease burdens like HIV/AIDS. Confining the few doctors to one employer, denies the majority of Zambians who seek care from private institutions. As far as we are concerned, private institutions serve Zambian citizens and public service workers, in their time, work in these institutions for the same purpose of serving the public and improving health indicators. This restriction, if followed, will impact the attainment of Universal Health Coverage (UHC) which implies that all citizens have access to health services of the highest quality. It is no doubt that today, the public service boasts of highly qualified medical doctors. Therefore, this directive, denies the members of the public access to quality health care of the highest standards as envisioned by the very government. The Association wishes to clearly state that it is not a crime to opt for private health care by members of the public and that private sector contributes significantly to meeting the targets set by the same Ministry, reducing unemployment rates and contributing to GDP through various taxes. The Ministry should remember that regulation no.86 has been in existence for a long time and equally dual appointment for senior doctors has been in existent for a long time. The dual appointment in service areas as well as academic institutions has benefited the ministry greatly as at one time, only the University of Zambia had Specialist to teach, mentor and supervise doctors in the public sector. Therefore, government should not turn its back on its universities that produces the very critical human resource it employs by denying senior doctors honorary appointment in public and private universities. Failure to recognise the close relationship and need for dual employment in service areas and training, Zambia will not produce any quality locally trained doctors. We shall have to rely on foreign countries like Cuba or India to donate doctors like in the neighbouring countries- an unacceptable situation! The association has noted the growing trend of the ministry to push policies inimical to the development and progression of the profession in Zambia. Such policies are passed unliterary without any prior consultation with ourselves. We wish to remind government, Zambia doctors have sacrificed a lot, given up so many of their rights as workers for the sake of saving the public. 1. About 138 junior doctors employed last year have gone 7 months without pay! 2. Doctors went for 5 straight years without a pay raise until this year when they received a nominal rise that is not even worth talking about. 3. Resident doctors are currently being underpaid their fuel allowance for the past 5 years and have continued to live on the promissory note of the “issue being rectified”. 4. Specialist doctors are being deployed to all provincial hospitals without a corresponding match in their pay. This too is tantamount to abuse of employees. 5. Doctors in the public-sector work with limited resources and have gone without complaining. 6. Licensure fees hiked to unthinkable amounts without any regard for what doctors get paid. The public may wish to know that government has no jurisdiction to what an employee does outside their working hours. While we appreciate that medical doctors are on duty all the time, in case of an emergency, government has got no right to abuse these overworked and underpaid workers! The Permanent Secretary should also be reminded that the President of the Republic of Zambia, Mr Edgar Chagwa Lungu, instructed senior civil servants to engage in meaningful economic activity such as farming. This gesture was followed by extension of cheap loans through the Public Microfinance Company. The Ministry should tell us whether they have disregarded this policy direction from the head of state. The Association recognises that farming, is not the only economic activity medical doctors can and should engage in. The Ministry should also realise that Senior Doctors play a critical role to raise critical revenue for the public institutions through high cost services, consultancy services and Research. We need not remind government that should our members withdraw labour based on this directive, there will be massive disruption of service as most hospitals will lose out of the critical funds realised from High Cost, Consultancy and Research. It is no hidden secret that government funded facilities do not receive their Monthly grants as it should be and the catastrophic effects of this directed will have far reaching consequences facility funding. ZMA is aware that our members are actively paying tax on income realised through private practice and various consultancy services. ZMA shall not stand aside when government passes policies meant to impoverish the profession. However, we shall continue to support progressive and meaningful policies aimed at improving health outcomes and Health Finance such as National Health Insurance. We remain open to discussions aimed at improving the profession and the health sector! Well said Dr.Mupeta. The government should not discourage the few doctors who are practising in Zambia.Life is tough and they are doing a tremendous job. It seems the govt does everything in its power to encourage the brain drain when they should be doing everything in their power to look after their intellectuals across all sectors. IF PJS MATTER SO MUCH RESIGN AND CONCENTRATE ON THEM, BE PART TIME ON GOVERNMENT JOBS IF YOU CARE – THANKYOU. When this is done, we are gonna have no siphoning of medicines bought by tax payers money and no conflicts of interest. You can’t serve two masters at the same time. Medcare is a service. Citizens are customers and so malicious referrals to where solutions seem to be found will be at private clinics. Yes! Failing to operate well at public health facilities but pumping up elite services at private facilities. The Government should put their foot down on this. Excellent observation. I have a lot friends who are doctors and they moonlight….I tell you if the dont do it; I doubt they can even be proud of their careers as they are paid peanuts by govt….you have hypocrites like Lazy Lungu stating that its normal for him to receive gifts from contractors in the name of the president yet he doesn’t want doctors to supplement their income through hard work. I totally agree with Dr MUPETA government is not paying our brothers and sisters who have been working for seven months now.wat do you expect them to eat or survive everyday.it is very shamefull that they have now become beggers.if only you could see the work they do you would be sorry.if they can work from 7 today to 8 the following day on empty stomachs whilst you the person giving that directive has had all your meals in a day do you call that fairness.its inhuman. “But in a statement, Association President Dr Francis Mupeta has since warned government to desist from taking doctors for granted.”With an influx of students doing medicine in China, Russia & India, this time doctors are no longer the elite and so are lawyers.You cannot hold the government to a ransom anymore. I thought this is a good idea to help doctors in fatigue management. Muzamuziba yesu ba mambala. I don’t know the terms of employment for civil servants. What I do know however is that in most private companies, once you’re employed, you are not allowed to work for any other company especially if you’re going to be using the same skills for which you’re employed by the first company. This is because a number of companies maybe producing similar products and services and therefore in competition. there maybe risks of espionage and information leaks. My assumption is that if the other company employs you but you’re using skills which maybe part of your hobbies such as agriculture skills when you’re an accountant or doctor professionally, then there is no problem. This isn’t always the case because terms are different from one company to another. RIGHT NOW MOST OF THE NEWLY RECRUITED REGISTERED NURSES AND CLINICAL OFFICERS ARE NOT GETTING SALARIES BECAUSE THEY WERE RECRUITED WITHOUT POSITION ID NUMBERS BOTH VIA MOH AND VIA GLOBAL FUND. THEY ARE LANGUISHING IN HEALTH CENTRES. The loophole of democracy coupled with weakened institutions is that people in authority know less than those they have authority over. Instead of seeing the vistas they only see limitations and self-interest. It is sad that a Ministry with largely same profession leadership should blunder and stumble so miserably like this. I trust a solution will be found speedily to restore sanity and enable our hard working medical professionals work with little restraint from unnecessary decrees. Remember how teachers used to behave when conducting private tuitions. They were always trying to do better during private tuitions than when teaching at a government school. The idea was to make sure that everyone enrolls at their tuition centers so that they could start making more money. I never went to tuitions because I was always a step ahead of the teacher and could see through their schemes. They were full of surprises but they were people they could never beat with their schemes. For example, They would bring questions in a test whose topic they knew has not been covered at school. When people fail, the teachers would punish them and later tell them that the secret is attending private tuitions. I know detractors won’t see your logic. It pains each time I go to the hospital only to be told that it has run out of BP drugs like atenel but only to find it at ka pharmacy owned by our local doctor. It’s obvious that is the free drug meant for me which I will now pay for. Second, the administrative law can be based on regulations through circulars and memos. A civil servant must follow administrative regulations until the regulations are rescinded. Any disobedience must be justiciable. A late payment is not an excuse for jungle law. Walikwata amano iwe. God bless you. Dr Mupeta you are the one stealing government medicines for your private practices! I agree with the PS! That’s the point detractors of progress are missing or deliberately missing. I’ve friends who work for hospitals. There pay is better than those working in the mines but because of love for hilife they still want to steal from our institutions causing perpetual medical shortages. Even lectures teach during their off hours to supplement the peanuts that they get at unknown dates these days. They can have their own private practice provided it is done when they are off or after working hrs. This chipantepantes are abusing SIs like no man’s business. Chitalu is busy stealing and building mansions and you want others to wait for peanuts until 65 yrs. You must be a moron. Bamwine the logical thing to do is if you think the government is not a good employer don’t get employed by it. Establish your own hospital instead of complaining while you steal drugs from the hospital. If you think you can be employed overseas just go. A lot of equipment and drugs are being stolen by the same doctors you’re supporting. Nobody forced them to join government institutions and like Trump told the window of a USA soldier. ..these doctors knew what they were signing for. While I support doctors, I will point out that most of these doctors steal government equipment and medicines from hospitals which they later use at their clinics. Just on Sunday a hospital employee with his wife were arrested for stealing 27 million kwacha worth of medicines from Mansa General Hospital. Besides thefts doctors like teachers don’t seem to pay much attention to patients at public hospitals which results in patients opting for private clinics which belong to these same doctors. Let’s not just condemn government for the sake of it. It is irresponsible to scan and circulate by social media government documents bearing official insignia, such as letterhead or court of arms. A public debate is better between two professionals in the same professional category to exchange different opinions. The public will then judge the debate side that is more reasonable and more convincing. In this way, government will gauge the public mood and then take the public mood into consideration without succumbing to sentiment devoid of logical arguments. WHEN ALLOWED TO DO PRIVATE JOBS THESE DOCTORS DEVOTED ALL THEIR TIME TO THEIR PRIVATE JOBS LEAVING GOVERNMENT JOBS IN SHAMBLES, BESIDES IT BECOME A CONDUIT TO EXTERNALISE MEDICAL EQUIPMENT AND SUPPLIES TO THESE SAME PRIVATE INSTITUTIONS OF THERE’S, YOU FIND A DOCTORS AT A GOVERNMENT HOSPITAL TELLING YOU THAT YOU CAN ONLY BE BEST TREATED AT CLINIC X AND ALSO BUY YOUR DRUGS FROM PHARMACY Z, PLEASE CITIZENS IF YOU SEE THESE DOCTORS MOONLIGHTING REPORT IMMEDIATELY SO THAT THEY ARE DEALT WITH. THEY ARE THE ONES EVEN STEALING MEDICAL SUPPLIES, BUT NAIMWE BA GOVERNMENT PAY THEM THEIR ARREARS BEFORE THEY JUSTIFY THEIR THEFT. i see nothing wrong in doing a private job, in my free time! gvt does not own me, i have to supplement my income as long as am not doing this at the expense of gvt job!!! Dr. Francis Mupeta, chose between the two as simple as that bwana instead of lamenting. You are the ones who have been taking the patients for granted. I even doubt it if you pay taxes for the two jobs you do? I agree with the PS, the problem is with you Doctors, you only work for a few hours at the Government Hospital and then rush to Private Hospitals and to more hours of work there, leaving Patients on long waiting queues at the Government Hospitals. One example I can cite is UTH. Just how can you make a Patient wait for 9 months for him or her to be operated upon, can’t you even find that the Patient has kicked the Bucket sure. 53 years after independence, such things are not supposed to happen. Further, even Dr Kaunda never allowed the Government Medical Practitioners to work for the private Hospitals. Conflict of interests is the problem that arises when you allow workers to roam freely! Many will deny patients good service in public institutions and will be directed to certain private institutions where the poor patients get to be attended to by the same doctors, nurses, etc! Such employees will steal from employer GRZ in terms of various supplies from Lab and X-ray reagents to medications! These are facts of what goes on! The trouble is GRZ has not paid attention to poor conditions of service and has allowed a wrong practice to become the normal! Go to any country in the region. Moonlighting is expressly forbidden for Civil Servants! This is GRZ problem! Health workers have no choice but to use initiative. Improve conditions first and all will be fine! I agree with the PS, the problem is with you Doctors, you only work for a few hours at the Government Hospital and then rush to Private Hospitals to do more hours of work there, leaving Patients on long waiting queues at the Government Hospitals. One example I can cite is UTH. Just how can you make a Patient wait for 9 months for him or her to be operated upon, can’t you even find that the Patient has kicked the Bucket sure. 53 years after independence, such things are not supposed to happen. Further, even Dr Kaunda never allowed the Government Medical Practitioners to work for the private Hospitals. This new regulation is very good for mother Zambia. In fact it has been long over due. These so called medical doctors in government hospitals and clinics are busy stealing drugs taking them to their private clinics. This is purely conflict of interest. Corruption and stealing is just too much in this country by both politicians and civil servants. Kudos to the govt! Dr Makasa Kasonde (Private Citizen) has put it aptly so well. The govt is putting in measures to curb theft of medicines and equipment, coupled with conflict of interest by health workers. Human life MUST be handled with due dilligence and cannot be compared to other jobs. We’ve witnessed situations of health workers performing shoddy work at hospitals due to fatigue. I see nothing wrong in this circular and if not happy with it request for round table meeting and reach a consesus with employers. IF YOU WANT TO CURB THE THEFT OF DRUGS, YOU DO NOT STOP THESE PEOPLE FROM DOING PRIVATE PRACTICE. IF ANYTHING “UUBOMBA MWI BALA ALYA MWIBALA”. THEY WILL ONLY HAVE ONE SOURCE OF EXTRA INCOME. I.E. HELPING THEMSELVES FROM THE HOSPITAL MEDICINES. IT WILL EVEN BE WORSE. The problem is hero worshiping of Doctors. The fact that they are in the medical world does not make them any special. It is just a profession like any other. We attend same schools and at times tackle tougher subjects than theirs. We are just one people. In 2014 my brother in law was admitted at the UTH for kidney problems. A doctor advised the family to take him to a certain private clinic within the Longacres area. When he was taken there the family was surprised to find the same doctor who had suggested that we get our patient to this particular hospital. To add salt to injury the doctor had actually “borrowed ” equipment from UTH. Question is why didn’t this doctor heal our brother at UTH in the first place. ? they stole billions of us dollar drugs and now they dnt want you to talk bout it .. what to they do its js to bring up a silly circular to shut u up…….they stole the drugs let them tell us were they took the drugs……. am at ministry of lands in Lusaka now trying to get a title deed, out of 9 counters, only 1 is serving customers. You can imagine the queue, very unproductive. I am non partisan but surely even if minister of lands is busy in Chilanga campaigning. Doesn’t serving the people come first. This country, you can shed tears.I am being factual and non malicious here, where are the efficiencies to move the country forward. My take is that its okay to do private jobs only if and only if such an undertaking does not undermine the GRZ Service delivery to the Public. But from what we have experienced, the Medical Doctors have devoted more time and seriousness to private jobs. Given this situation its better such Doctors to leave the GRZ job and join the private 100 percent. This will free positions for those who are not yet employed either by GRZ and Private. Terms and conditions of service of the civil service are clear. One is not allowed to hold two jobs or draw two salaries. Its not only for Doctors it’s for the entire civil service. If you don’t like it engage the Unions to change the conditions. Whenever I am mending the fence at home my two dogs always get excited. At first I didn’t understand what it was all about until my servant told me that those holes I am mending are the same these dogs use to get out of the yard for their nightly excursions. But why should it be the medical personnel to be forbidden what about others like teachers. Does it mean that even police reserves who are govt workers should resign? This is what we can term as a poverty oriented mind set. Police reservists don’t get paid. It’s completely voluntary. This is the corruption to address seriously too. Not just nchekalako. There should be a clear divide between interests. Doctors now smell your perfume or check the brand of the added hair before deciding to attend. If it smells good or looks more Peruvian then you are told of a long queue even in emergency so that they entice you to a private hospital stocked with pilfered supplies like those missing ARVs from Medical Stores. Teachers were banned from similar practices. Lawyers wouldn’t dare do that. Police and Soldiers can’t own Private Security companies. Why the ballyhooo with Doctors? Why do Zambian Doctors act like small Gods or more aptly Small Lucifers? Just quit and work in the private sector if you don’t want to work in the civil service. Final question : If the doctor gets peanuts how does he manage to stock all those medicines at his surgery? How did he afford all that equipment? Stealing!!! Even ambulance drivers can afford to drink Castle everyday and build mansions, important cars from Befoward. Delicate issue not for cadres. Health is wealth. Another way to look at it – Is it okay if the president of country A starts building mansions in countries B and C? Doesn’t the new constitution disqualify citizens with dual citizenship from public office? Doesn’t that present conflict of interests and security risks when that involves the head of state – whether gift or kick back? A double-minded person is as unstable as water! With all due respect Medical Doctors, If you think that the K25 000 paid to you from GRZ is peanuts, Please Kindly resign and go to the private Hospitals where you will be paid more. The government will bring in Cheap Chinese Doctor, who will be getting a pay of K 10 000. This is a good move. You cannot serve two masters at once. The same doctors offer shoddy services at a govt.clinic or hospital then refer you to a private clinic which can give you a better service which just happens to be his or one of his friends clinic where he is moonlighting so that he can make give times the money for the same treatment that could have been done at the govt. Clinic or hospital. But there he would just be on salary. That is why even education standards are down just like health services becoz teachers are also fond of doing the same just like health practitioners. Delivery Organizations Organizational Behaviour: A government medical Doctor working in a government hospital he spends part of his working time in his own private practice. Economics	(1) Medical doctor’s salary is too low and punishment for corruption is too lax. (2) access to healthcare is free in government hospitals; some clients are willing to pay.